To produce black tea, the leaves are rolled and fermented before being dried. During fermentation, the catechins develop into two other polyphenols called theaflavins and thearubigins. Thearubigins account for about 70 percent of the active polyphenols in black tea, reported the European Journal of Clinical Nutrition in July 2013. Researchers at the University of Oslo in Norway divided 111 men and women into two groups. One group drank three cups of black tea daily, while the other group drank a placebo that was similar to black tea but didn’t contain polyphenols. The tea-drinking group gained less weight compared to the placebo group. They also experienced a reduction in waist circumference. Even though the study ran for six months, all of the weight loss occurred in the first three months, according to the report in Food and Function in July 2014. 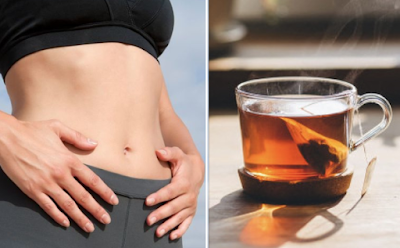 An earlier study also found that participants who drank black tea extracts lost more weight and significantly reduced waist circumference and visceral fat compared to the group that drank a placebo. That study was published in Nutrition Research in June 2011. It's not fully understood exactly how black tea causes weight loss, but a study using lab rats suggests that polyphenols may suppress the growth of fat cells while increasing the breakdown of fat, according to a November 2009 report in Nutrition Research. More recently, a study in the February 2012 issue of Food and Function found that black tea helped reduce high blood levels of leptin in lab rats. High leptin leads to leptin resistance, which makes it hard to lose weight. The results from animal studies, however, don't always mirror the effects in humans, so more research is needed. In the short run, the caffeine in a cup of black tea may support weight loss by suppressing your appetite or boosting the number of calories you burn. Eight out of 12 studies reviewed by the International Journal of Obesity in February 2010 found that caffeine increased the amount of energy used by the body. Some studies also reported that caffeine improved the breakdown of fat. The results only lasted for a limited period of time, however. A cup of black tea has 14 to 70 milligrams of caffeine. Most people can safely consume up to 400 milligrams of caffeine daily, advises the website MayoClinic.org.